The Yukon Salmon Management Area encompasses the largest river in Alaska. The Yukon River and its tributaries drain an area of approximately 220,000 square miles within Alaska, while the Canadian portion of the river accounts for another 110,000 square miles. The river flows 2,300 miles from its origin 30 miles from the Gulf of Alaska to its terminus in the Bering Sea. Chinook salmon and chum salmon, both summer and fall, are of the most importance to the Yukon River area. Sockeye, pink, and coho salmon, while present, are of minor importance. 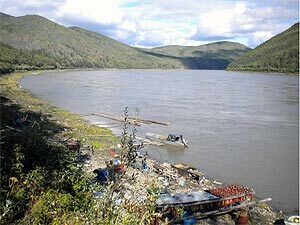 Chinook salmon have been in a prolonged period of low productivity and this has resulted in much hardship to the residents of the Yukon River drainage. Chum salmon returns, while better than Chinook returns, have been erratic since 1993, with some very poor returns that restricted both commercial and subsistence fishing. Adding to these problems, poor prices and lack of buyers depressed the value of chum salmon harvested from the Yukon River at a time that fuel costs skyrocketed, making the economics of salmon fishing in the Yukon River even more challenging. Both the state and federal government increased funding for management and research after the poor fishery performance of the 1990s. The result has been a major increase in information about the numbers, spawning locations, and relative importance of particular tributaries in the total production of Yukon River salmon.